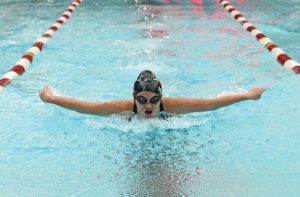 NAUGATUCK — The Naugatuck girls swim team finished up the Naugatuck Valley League regular season with its best league record since 2012. The Greyhounds shrugged off their only defeat to unbeaten Seymour by beating Watertown, 101-85, on Oct. 12 and Wilby/Kaynor/WCA, 106-76, Oct. 16 to finish 8-1 in NVL meets. Naugatuck has one more meet left against nonconference foe Masuk on Thursday before they prepare for the NVL championship meet set for next week. In the win over Watertown, sophomore Katelyn Fortney (50 freestyle, 100 butterfly) and freshman Jacqueline Uva (200 IM, 100 freestyle) were double-winners to lead Naugy. Junior Molly Kennelly won the 100 backstroke (1:08.95), senior Maria Guimaraes won the 100 breaststroke (1:20.97), and the foursome of Uva, Fortney, senior Julianna Scully and sophomore Abby Shugdinis won the 200 freestyle relay (1:51.31). The 400 freestyle relay team of Uva, Fortney, Kennelly and Shugdinis posted a winning time of 4:12.05. The Greyhounds showed off some of the team’s versatility that will make them at NVLs in the win over Wilby/Kaynor/WCA. 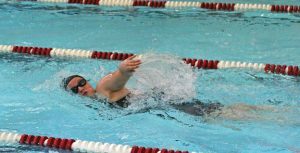 Naugy took first in six individual events with six different swimmers. Senior Taylor Siefer won the 200 freestyle (2:38.48), freshman Haley Deller took first in the 200 IM (2:34.84), and junior Emily Sarmiento won the 50 freestyle (29.76). Senior Francesca Spino won the 100 butterfly (1:24.12), senior Abrianna Hasipi took first in the 100 freestyle (1:03.64), and freshman Kelly Brodeur won the 500 freestyle (6:24.72). Senior Katie Brown scored a 233.20 to win the diving competition, and the 200 medley relay foursome of Kennelly, Guimaraes, Fortney and Uva posted a winning time of 2:07.54.